Two players working together to have a good time. Did you know SCE Japan Studio's platformer Puppeteer includes a fantastic co-op mode? It isn't exactly being shouted from the rooftops, but it's well-worth checking out. You know, if you like good games and good co-op and stuff. Released with quite a bit of praise, the whimsical PS3 exclusive Puppeteer is a fluidly animated game with some beautiful graphics and voice acting. It stars a young boy named Kutaro who has been turned into a puppet and has had his head ripped off. To stay alive, Kutaro finds noggin' substitutes and attaches them, granting him different abilities. He's also armed with a pair of magical scissors that allow him to attack enemies and move along surfaces made out of paper. Accompanying Kutaro is Ying Yang, a ghost cat who can examine objects and locate heads for Kutaro to equip. This makes a very natural set-up for some co-op gaming. A second player can control Ying Yang using just a few buttons on the controller. Instead of serving as a human-controlled Navi, though, Ying Yang players help Kutaro by knocking the heads off of enemies, collecting items, destroying pesky obstacles, and blocking certain attacks during boss fights. The beautiful part of Puppeteer's co-op is that it's designed with a no-fail mentality in mind. The second player never gets in the way of the game, they only contribute. This allows less experienced players (kids, grandparents, the milkman) to enjoy a cooperative experience without worrying about ruining everything. Nobody's going to get mad at anybody else for missing a jump or causing yet another game over screen to appear. It's one of the most cooperative co-op mode we can imagine. 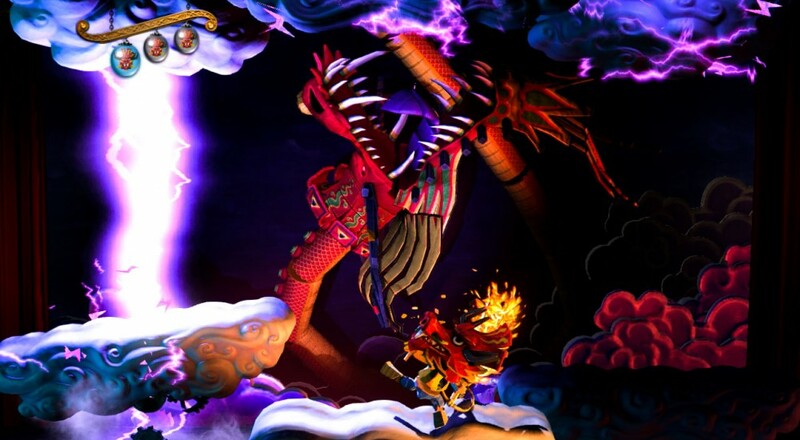 Puppeteer is currently available for PlayStation 3. It supports two player local co-op.